D500 Compressor — The D500 is capable of delivering 20–40 PSI operating pressure depending on the airbrush used, and delivers 0.4 CFM at 20 PSI. It operates on 110–120V and features a grounded three-wire cord. CSA approved and UL listed. Weighs 8 lb (3.6 kg). 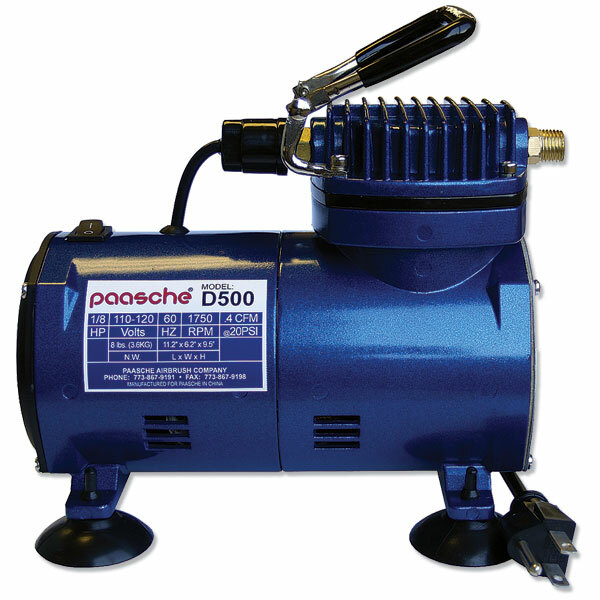 D500SR Compressor — The D500SR is capable of delivering 20–40 PSI operating pressure depending on the airbrush being used, and delivers 0.4 CFM at 20 PSI. It includes an R-75 Regulator/Filter with gauge, which regulates up to 40 PSI, depending on usage (intermittent or constant) and the airbrush size. 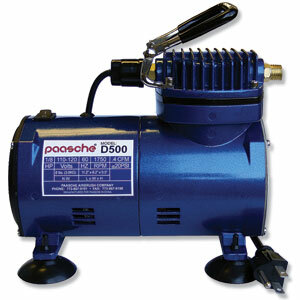 The compressor operates on 110–120V and features a grounded three-wire cord. CSA approved and UL listed. Weighs 9 lb (4.1 kg).